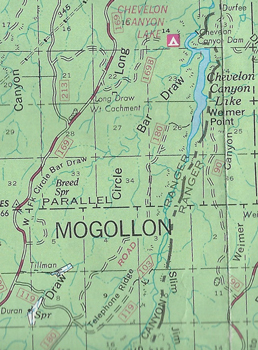 Chevelon Lake is one of the "Rim Lakes" found up on the Mogollon Rim northeast of Payson Arizona. 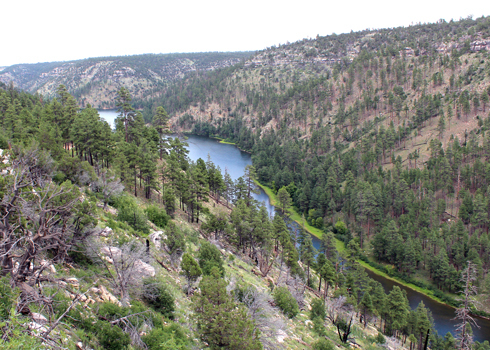 Formed by an earthen dam across Chevelon Creek, the lake is probably the least accessible of the lakes in the area. It is a long drive on dirt roads out to the vicinity of the lake. With no vehicular access to the water allowed, all watercraft that are to be used must be carried or carted down about a mile to the lake's edge. The most common route to the lake is to drive the FS 169 road to the FS169B turnoff and then travel east along that road about 1.6 miles to the campground. There is a locked gate across the road about .1 mile below the campground. Most people park along the 169B road and then walk the old roadway on down to the lake at the dam. I have never walked the shoreline away from the dam, so I do not know how easily that is accomplished. I have carried a canoe down the trail twice. It is a very steep climb back up the hill! A report here describes our most recent trip down using this route. On our last visit, we noticed a few people coming down at the southern end of the lake. I recently had the chance to scout the southern trail. The trailhead is accessed by driving the FS 180 road to the trailhead. The 180 road was very rough north of its intersection with FS119. It was not 4WD at the time, but could very easily be when wet. There were many large rocks and several rutty areas to avoid. At its northern end, FS 180 makes a hard right turn and heads toward the rim of Chevelon Canyon. It ends at a couple of nice campsites. It is then just a few feet over to the edge for a view of the lake toward the north. Chevelon Creek is directly below. The trailhead is marked with a simple sign. The pathway is obvious. It is less than 1/2 mile down to the lake. Once there, an obvious path makes its way along the shoreline. There are really nice campsites and great views up and down the lake. We didn't have time to really walk the shoreline trail any great distance, so I do not know how far that it goes. I haven't decided whether to try and bring a boat down this trail. I have seen guys carrying their float tubes. I am, at the least, planning on bringing my grandkids back on a backpacking trip to spend an overnighter next to the water! A real treat for us on the walk back up to the trucks was the sighting of a bald eagle.